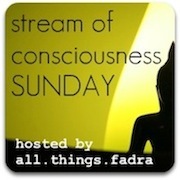 I'm taking part in my friend Fadra's great meme, Stream of Consciousness Sunday. The premise is awesome. Set a timer for 5 minutes and just write. Don't edit. Don't ponder too much, just write. Today’s (Optional) Writing Prompt: Do you have a secret blogging life? Are you connected to your “real life” friends and family through social media? How does that affect your writing? While I don't have a "secret" blogging life, there is a significant group of my friends and family that don't understand what I'm doing. I'll admit, there are days when I don't understand it. I will get a box of fun stuff to review on my front porch(thank you ups) and wonder why on earth I'm the one chosen to review. The question frequently leads me to ponder why I am blogging. The why of blogging is a huge question for me. (I think the answer is slightly different for every blogger.) I love the outlet. I love the ability to be a little creative. I love having this little slice of the internet that is mine(cue the seagulls from Finding Nemo~ mine mine mine mine) Who reads my blog has very little impact on how I write. I am always writing for me. I hope that readers/viewers get something out of it, whether that's a laugh, new information or a new perspective, but I am always writing for me. I do love that social media allows me to keep in touch with friends/family/loved ones who don't live nearby. I think I rely on Facebook too much sometimes when I should be reaching out to my friends. And my five minutes is up. If you want to participate, or just read some of the other Stream of Consciousness posts, head over to All Things Fadra to get the scoop. A wise friend taught me once to speak with conviction...the rest will follow!